Think the current retro styling trend is a recent phenomenon? Think again. Believe it or not, Oldsmobile was first on the block to implement retro styling and they did it with great success more than 40 years ago. For the 1966 model year Oldsmobile released one of the most stylish cars it ever produced, a 2-door sporty luxury car called the Toronado. It had futuristic styling with retro cues of the 1936 – 1937 Cord 810/812. The Toronado’s popup headlights, front grille with horizontal slots, aerodynamic wheel covers, and fender humps over all four wheel wells were all a dead give-away that Oldsmobile intended to the Toronado to be a modern version of the Cord. The 1936 – 1937 Cord 810/812 needs no introduction. It was the most futuristic car of the 1930s. Its exterior design was clean and aerodynamic, long before automakers knew what a wind tunnel was. The pop-up headlights and overall very clean and smooth design would have hordes of admirers for many years after its introduction. Most will remember the Cord name but very few will remember the Auburn Automobile Company, the parent company that made these beautiful cars. Unfortunately its life was too short, the company folded at the end of the 1937 model year. It would seem the futuristic Cord would not have a successor, so it was a nice surprise when Oldsmobile paid the ultimate respect to the Cord by integrating some of its styling cues into its new 1966 Toronado. 1966 was the first year for the Toronado, which was treading new territory for Oldsmobile. The Toronado was to compete in the sporty 2-door luxury market that the 2+2 Thunderbird had so successfully started. It was below the surface of this innovative new Toronado that bore the most striking tribute to the Cord. Just as the 1936 – 1937 Cord 810/812 had styling well ahead of its time, its drivetrain was front-wheel drive which was also well ahead of its time. As other automakers would later adopt the Cord’s aerodynamic styling and pop-up headlights, so too would many automakers go with front-wheel drive by the last quarter of the 20th century. The Toronado was front-wheel drive like the Cord. The Toronado’s front-wheel drive system was not only a first for Oldsmobile but also GM. In fact the Toronado was a big trendsetter for GM, hence 20 years after its introduction a majority of GM’s cars would be front-wheel drive. This was no minor step for Oldsmobile after-all designing a front-wheel drive car powered by a very powerful big block V8 was no easy task. When GM was at its nexus, long before the bean counters took over in the 1980s, it had a habit of letting its designers go wild with the pen. The results were cars that were benchmarks in automotive design. The Toronado was an example of this policy. It looked so modern and sleek, that even when you see one today more than 40 years after its introduction, it still looks modern. It’s a design that will never go out of style. If Oldsmobile had not been on the receiving end of the hatchet a few years back and made a new retro version of the 1966 Toronado, it would be a big success. The styling personified sleek, low, and aerodynamic. Every edge, curve, and line on the Toronado fit so perfectly with the overall styling. Even Leonardo da Vinci could not improve the Toronado’s artful design. The front-end design with its vacuum operated pop-up headlights looked so clean as if its main purpose in life was to cheat the wind. The rear taillights curved ever so perfectly to offset the beautiful rear trunk-line and fastback roofline. And if the perfect exterior design was not enough, Olds just did not know when to say "when". You have to remember this was before the days of bean counters forcing designers to do just the bare minimum to keep their customers happy. The Toronado’s interior was not like most cars produced in the 1960s, it had flair and was more modern looking than the cockpits of the new jet airliners that were popping up at all the major airports at the time. The dash was modern and even had a rolling speedo. The sporty steering wheel looked like it came right out of the batmobile. The standard Toronado had a bench seat, which was comfortable and luxurious. However it was the "Deluxe" trim package that offered a more comfortable and luxurious interior with plush seats with a front center armrest. The Toronado was so roomy inside. Back in the day, when looking at the large interior, the eyes soon spotted what made the Tornado seem so spacious. It was the flat floor, which made all the other cars during this time period with transmission/transaxle humps seem cramped in comparison. This was one of the big benefits of front-wheel drive. Since the transmission and transaxle resided directly underneath the mammoth 425 V8, there was no need for a big tunnel hump which the middle front and back seat passengers on most other cars had to straddle like a cowboy did when he rode his horse. The side glass windows were curved, which was first introduced on the 1961 Lincoln Continental and 1961 Ford Thunderbird. But unlike these two cars the Toronado did not have the ugly side vent windows. By the 1970s vent windows would bite the dust on most cars. Most buyers loaded up their Toronados with many power and convenience options. Surprising, the more expensive "Deluxe" package was the most popular trim package. This is why today when you find a surviving 1966 Toronado, it more than likely will be loaded with power windows, power door locks, power antenna, "Deluxe" trim package, and many other options. It was a fairly common for a loaded 1966 Toronado to roll out of the factory with a price tag close to $6,000, double the average car price. The high price tag did not deter sales, 40,963 total buyers proved that Oldsmobile’s gamble on the Tornado’s edgy futuristic styling was a wise decision. Motor Trend agreed and awarded the new Toronado it’s coveted "Car of the Year" award for 1966. 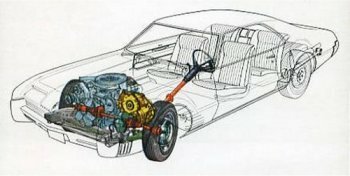 The 1966 Toronado was built on GM’s new E-body platform, which it shared with the rear-wheel drive 1966 Buick Riviera. The following year Cadillac would release its new E-body platform front-wheel drive Eldorado. The Toronado used a combination front subframe and rear unibody frame structure, which gave the Toronado great rigidity and strength. The Toronado’s suspension for a 1960s car handled well and had a nice ride that luxury car buyers expected. The front suspension was a double wishbone design that used front torsion bars, a GM first. The rear suspension was a more traditional leaf spring design. Powering the Toronado was an iron monster, a 385 horsepower 485 lbs/ft of torque 425 CID Oldsmobile Rocket V8. It was the most powerful 425 V8 engine in Oldsmobile’s arsenal for 1966 and a Toronado exclusive. It had a free flow intake manifold and a dual snorkel air-cleaner, which helped the powerful 425 V8 breath and perform better than the 425 V8 offered in Oldsmobile’s other cushy people haulers. To put this into perspective, Oldsmobile’s high performance muscle car for 1966, the 442, had as its top performance motor a 360 horsepower Ram Rod 400 CID V8. So with the Toronado a buyer not only obtained luxury and great styling but also a real hot rod. And the mandatory dual exhaust was also further proof the Toronado meant business. The Toronado went 0-60 mph in the 8 second range, which for a big heavy car that weighed in close to 5,000 lbs, was mighty impressive. As fast as the Toronado raced up to 60 mph, it took its sweet time getting back down to zero when the brakes were applied. The 4-wheel drum brake system was one area where the Toronado was not state of the art, and was only on par with the other luxury cars of the mid 1960s. Anyone familiar with front-wheel drive cars knows their weakness is torque steer. It occurs when the accelerator pedal is pushed to or towards the floor and the wheels pull to the side as if they have a mind of their own. The driver is left holding the wheel for dear life to keep those front tires correctly pointed. Interesting to note, the Toronado was immune to torque steer. Oldsmobile had done its homework and pulled out all the stops and made sure the Toronado was not a victim of torque steer. Oldsmobile kept the big 425 V8 in the traditional mounted position in the engine bay unlike most modern front-wheel drive cars that have an engine mounted sideways. The engine had an exclusive oil pan, which allowed clearance for the front-wheel drive infrastructure mounted underneath it. 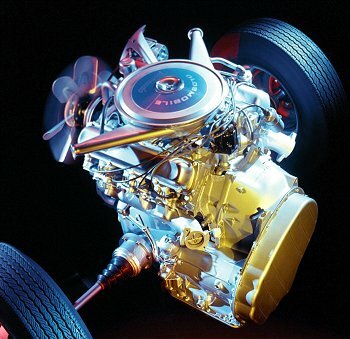 The heart of this infrastructure was a heavy-duty TH425 3-speed automatic transmission; essentially it was GM’s bulletproof TH400 transmission modified for front-wheel drive duty. A Hy-Vo drive chain connected the torque converter to the TH425. This setup was practically bulletproof, quiet, and eliminated torque steer. Oldsmobile had a real winner on its hands with the Toronado. Unfortunately as the Toronado aged it morphed into a conservatively styled 2-door luxury barge that lost its beautiful edgy styling and performance image. If this was not bad enough, it shrunk in size in the mid-1980s to an Oldsmobile Calais sized mini luxury car, with a hefty price tag. So its no small wonder why the Toronado went into extinction soon thereafter. Back in 1966, Oldsmobile’s future was bright, and if you were somebody important you drove a cool car like the Toronado. And as you’ve probably heard many times – "they don’t make them like they used to", certainly applies to the Toronado. It was not your father’s Oldsmobile.